Definition at line 16 of file CQSteadyStateResult.h. Definition at line 31 of file CQSteadyStateResult.cpp. Definition at line 42 of file CQSteadyStateResult.cpp. Definition at line 69 of file CQSteadyStateResult.cpp. Definition at line 47 of file CQSteadyStateResult.cpp. References mpProblem, mpTask, and mUpToDate. Definition at line 64 of file CQSteadyStateResult.cpp. 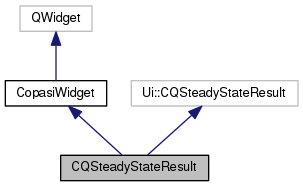 Definition at line 74 of file CQSteadyStateResult.cpp. References CCopasiParameterGroup::clear(), CCopasiRootContainer::getDatamodelList(), CCopasiTask::getProblem(), CSteadyStateTask::getState(), mpProblem, mpTask, and mUpToDate. Definition at line 102 of file CQSteadyStateResult.cpp. References C_INT32, checkSelection(), CLocaleString::fromUtf8(), CopasiFileDialog::getSaveFileName(), mpTask, and TO_UTF8. Definition at line 131 of file CQSteadyStateResult.cpp. References ListViews::CHANGE, CModel::compileIfNecessary(), CModel::getKey(), CCopasiProblem::getModel(), CSteadyStateTask::getState(), CCopasiTask::isUpdateModel(), mpProblem, mpTask, mUpToDate, CopasiWidget::protectedNotify(), CSteadyStateTask::restore(), CCopasiTask::setUpdateModel(), and ListViews::STATE. Definition at line 54 of file CQSteadyStateResult.cpp. Definition at line 35 of file CQSteadyStateResult.h. Referenced by init(), loadResult(), and slotUpdateModel(). Definition at line 36 of file CQSteadyStateResult.h. Referenced by init(), loadResult(), slotSave(), and slotUpdateModel(). Definition at line 37 of file CQSteadyStateResult.h. Referenced by init(), loadResult(), slotUpdateModel(), and update().